On average, each American recycles 321 pounds of paper and cardboard per year. 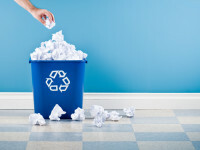 However, recent studies have found that about 15% of the material in the trash each week is recyclable paper and cardboard. Keep a recycling bin next to your trash can and where paper is heavily used, like your desk or family room. Clearly mark each bin to keep the trash out! Know the paper types you can recycle. This will depend on your local curbside or drop-off program. Call your hauler or city or town hall to learn what is recyclable in your area. Keep recyclable paper and boxes clean and dry. Use both sides of paper before recycling it. Print drafts on the back of used printer paper or keep a stack for use as notepaper. Reuse file folders and envelopes by covering old information with sticky labels. Sort your email and documents into electronic folders instead of printing them. If you aren’t sure how to do this, find step-by-step instructions online by searching for “organize email” or “organize computer files.” A good place to start is How to Clean Up Your Inbox. Check labels on paper products and look for the words “recycled content,” which tells you the paper was made using recovered paper. Many stores carry recycled-content printer paper, notebooks, loose-leaf paper, note cards, Post-its, greeting cards, and more. Making recycled paper uses 64% less energy and 58% less water than making the same type of paper from virgin natural resources. Strive to purchase post-consumer recycled-content paper. “Post consumer” means that the recycled paper used to make the product came from a collection program like the one where you live. Buying this paper helps complete the recycling circle and helps create demand for paper from local recycling programs. Learn more about paper recycling in America by checking out Paper Recycles.